With the intensification of Christian martyrdom across the globe in recent years, and most especially the recent martyrdom of Father Jacques Hamel, I found it very fitting today to rebrand an article that I wrote a few years ago focusing on the early Church Deacon and Martyr, St. Lawrence. He is one of the most venerated martyrs of the early Church. 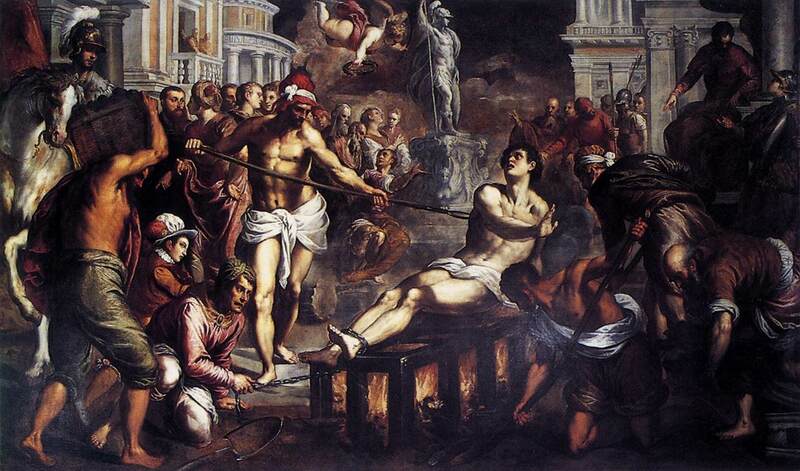 Once the executioner turned him over, Lawrence said, “It is cooked enough, you may eat.” After praying for the city of Rome and all the faithful of the Church one last night, Saint Lawrence gave up his spirit and died. Since the fourth century, Saint Lawrence has been celebrated as one of the most venerated martyrs of the Church. 1. Always speak the Truth of Jesus Christ and spread His Gospel message to those we encounter. The Gospel message is to be evangelized to all – from faithful Christians to unbelievers. As disciples of Jesus Christ and His Church, we are not to impose the views of the Church, only propose them to the world. 3. Always stand against those who seek to destroy us and persecute us for our beliefs in Jesus Christ and His Church. With great confidence and fortitude, we can overcome the challenges that stand before us. Throughout the world, many of us are being faced with a threat against our religious freedom. We must stand against such tyranny and battle for our religious freedom. 4. As Christians, we are called to be witnesses to the world. The term, martyr, comes from the Greek term meaning witness. Many of us will never endure red martyrdom (death), but we will endure white martyrdom (social persecution). As we stand against the depravity of this modern secular culture, many of us will endure social persecution. 5. All suffering leads to Jesus Christ on the cross. Whether our suffering is physical, mental, or spiritual, it can unite us closer to Our Lord who endured great suffering during his Passion. All suffering will eventually lead to glory and resurrection. For more on the subject of martyrdom, I would suggest reading my Quick Lessons from the Catechism and what Pope Francis said about martyrdom. Let us pray: O Lord, you gave us the great Deacon and Martyr of the Church, St. Lawrence, who passionately served you and your Vicar, Pope St. Sixtus II. Help us to be obedient to our current Vicar in all avenues of the Church. Give us the strength and courage we need to endure martyrdom and social persecution in this modern age. Amen. Fr. Jacques Hamel…Pray for Us. All Holy Martyrs…Pray for Us.